Snow peas are unique because you can eat the whole pea, including the pod. In the case of other peas, like English peas, the edible peas must be removed from their shells. Snow peas are best when they still have a little crunch, like in this recipe when they’re flash sautéed. 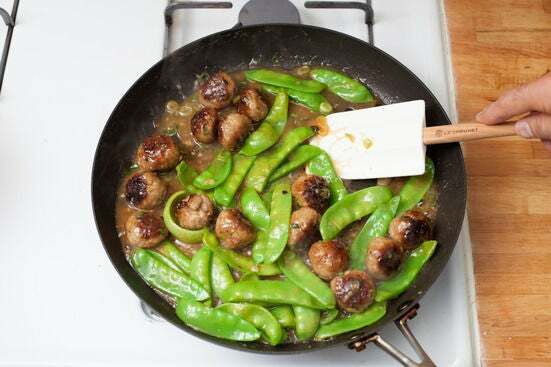 Cornstarch helps the savory sauce thicken into a glaze for the meatballs and the vegetables. 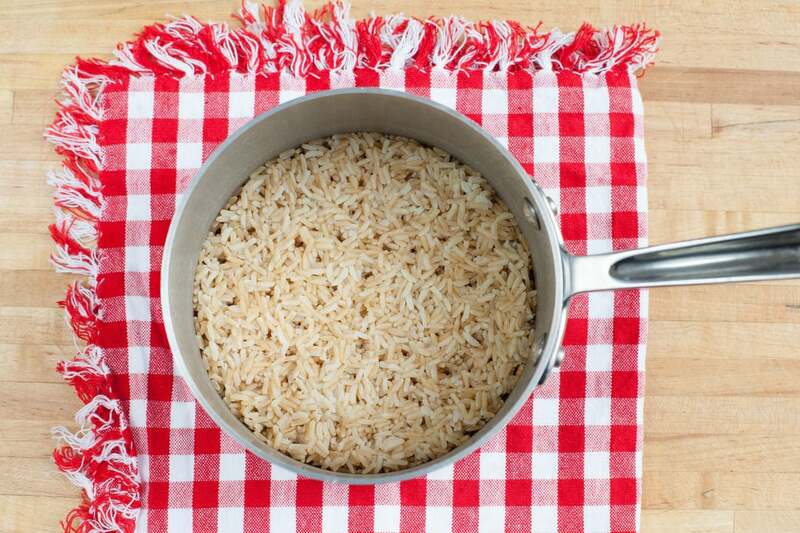 In a small pot, combine the rice with 1½ cups of water and a big pinch of salt. Heat the pot to boiling on high. Cover, reduce the heat to low, and cook 20 to 25 minutes, or until the water is absorbed and the rice is cooked through. Wash and dry the fresh produce. Trim off the stems of the snow peas and peel away their strings. Thinly slice the scallions. Peel and mince the garlic and ginger. Very finely chop the cilantro stems and roughly chop the leaves. Cut off the ends of the lemongrass, then peel away the fibrous outer layers until you reach the white, pliable core. Mince the lemongrass core. 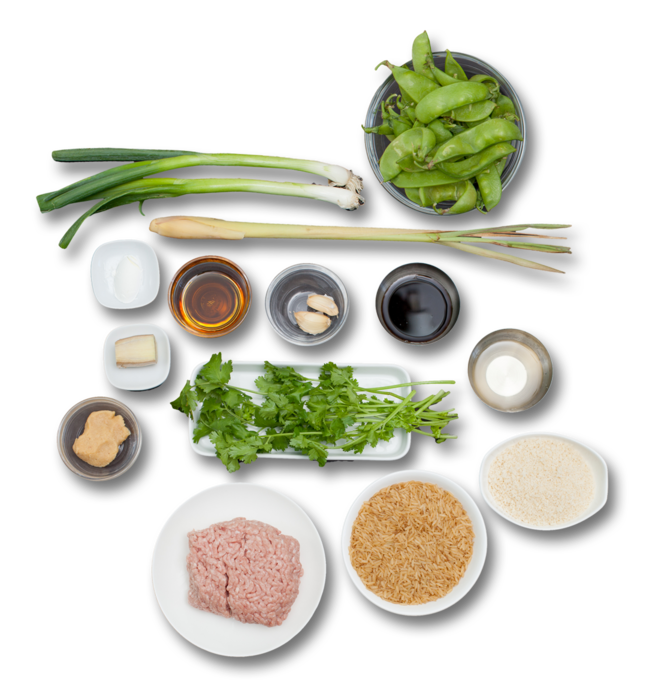 In a medium bowl, combine half the garlic, half the scallions, the cilantro stems, the ginger, the lemongrass, the pork, half the soy sauce, half the sesame oil, and the panko. Season with a little salt and pepper. Use your hands to gently mix just until everything is combined. 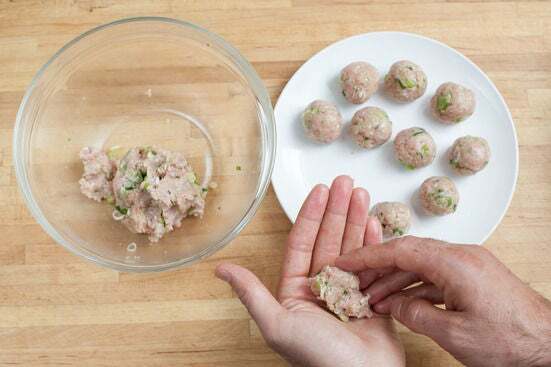 Form the mixture into tablespoon-sized meatballs. 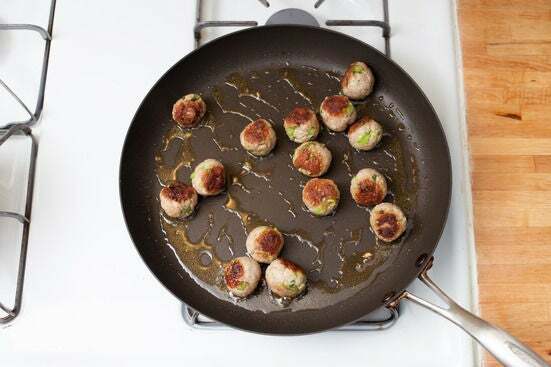 In a large pan, heat some oil on medium until hot. Add the meatballs and cook 8 to 10 minutes, turning to ensure they brown on all sides. While the meatballs cook, make the slurry. 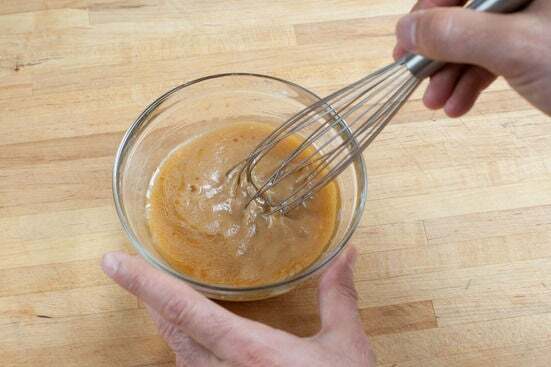 In a small bowl, combine the mirin, miso paste, cornstarch, remaining soy sauce, remaining sesame oil, and ¼ cup of water. Whisk until smooth. 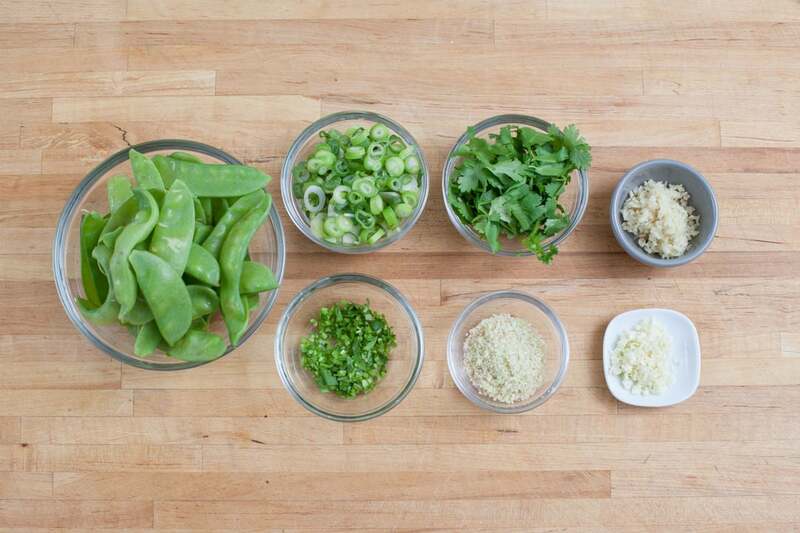 Add the remaining scallions, remaining garlic and the snow peas. Cook about 30 seconds, or until fragrant, stirring. Add the slurry. Cook about 1 more minute until the sauce thickens. Remove from the heat. Divide the cooked rice between 2 plates. 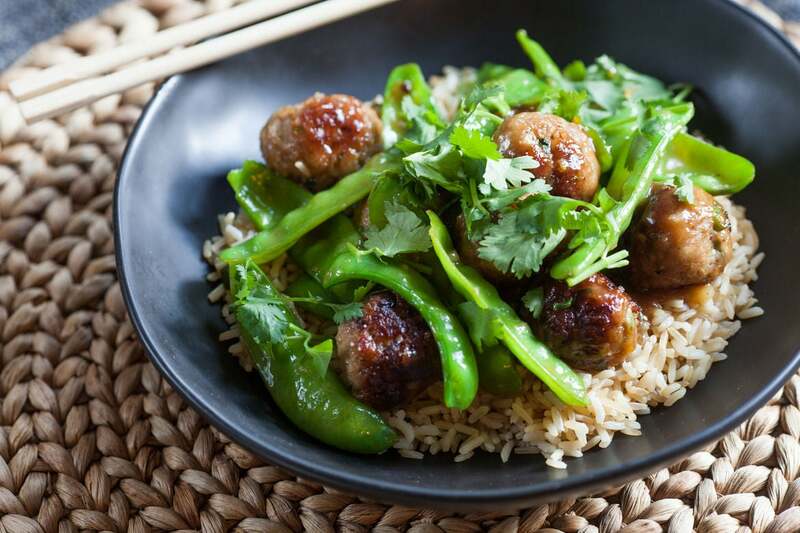 Top the rice with the meatballs and snow peas. Garnish with the cilantro leaves. Enjoy!